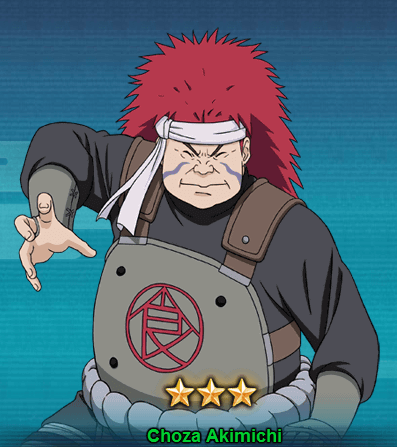 Choza Akimichi is the fifteenth head of Akimichi Clan and the father of Choji Akimichi. He is also the team mate of Shikaku Nara and Inoichi Yamanaka. He made huge contribution to the Fourth Shinobi World War. Let’s take a look at the abilities of Choza Akimichi. Taijutsu Super Expansion Jutsu: Cause Ninjutsu and Taijutsu damage against up to 4 of the opponent’s units and Knockdown to the selected units. Taijutsu Expansion Jutsu: Attacks the opponent’s front row and has a chance of 3 COMBO and the cause of Knockdown. Ninjutsu Akimichi Secret – Recovery: Increase attack and Defense, whenever receiving in a Healing Rate. Ninjutsu Chakra Swallowing: Recover Life by 10% when your own team recovers Chakra. Taijutsu, Ninjutsu Spiky Human Boulder: Chases and Attacks a Low Floated unit, causes Knockdown. You can get Choza Akimichi from Space-Time Shop. It will cost around 1500 Space-Time points for 5 Choza fragments. You can get Choza from Elite Instance : Body-Soul Separation.